Windows occasionally goes through a system crash or responds very slowly. But the innumerous entries in the event display hardly help you in troubleshooting. Since Vista, a reliability test has been available hidden in the Control Panel. To start it, first click ‘System and Security’ and then ‘Action Center’ in the Control Panel in Windows 7. Open the ‘Maintenance’ by clicking the arrow icon to the right, and then click the ‘View reliability history’ link below it. In Vista, click ‘System and Security’ and ‘Performance information and performance tools’. To the left, select the ‘Other tools’ category and follow the link ‘Open reliability and performance control’. Now select the ‘Reliability control’ to the left. A diagram will now show you at a glance the system stability chronologically with icons in different lines, showing which warnings and errors have occurred. With the ‘Days’ and ‘Weeks’ links to the left, you can define the period for which you can browse through. For more exact specifications on the detected problems, click in the time column in question. Windows will display all relevant individual events as a group. By clicking the ‘Technical details’ link, you will get further information about the relevant program, its path or the erroneous module. This is how you can identify the events relevant for system problems a lot quicker than in the detailed event display. However, the solution for that will have to be found out by you. 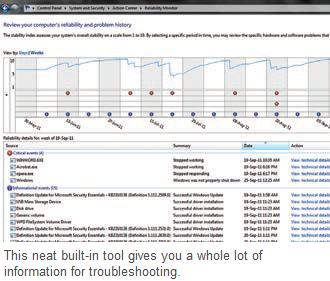 The ‘Look for solutions for all problems’ link, which requires information from Microsoft, is helpful. Otherwise, you should look through Google, forums or magazines to find a suitable remedy.